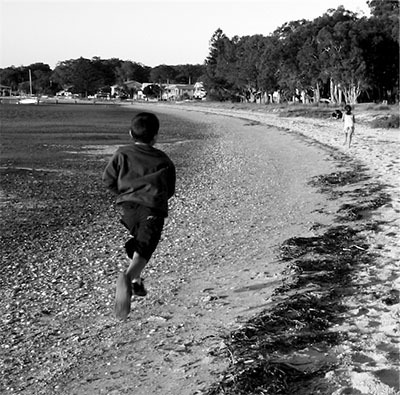 Grab Shot 129 - "Running to Mum"
"Walking back from a favourite photo shooting haunt, I saw these kids collecting crabs in the mud with their dad, whilst their mum looked on from the beach," said SD for Australia. "A few minutes after I walked past, I heard their excited yelps as they ran back to their mother relaxing on the beach ahead of me. I didn't have time to raise the camera to my eye, but rather went 'from the belt,' as I have read about many times in stories of how urban photographers get their best grabs. I just love the blur of the young boys foot, and that, even though you can't see his face , you can tell that he excited to show mum his new pet crab." Steve captured this grab shot with the ISO set to 400 in Normal Program mode. The settings worked out to be 1/160th @ f-8.